We republish this article from 29 November 2011 about that year’s District Council elections. New elections loom in November and Socialist Action is preparing to run again. This article shows how socialists approach these elections and electoral struggles in general – as a means to build stronger support for socialist ideas. The district council elections in Hong Kong on 6 November, 2011, were a big test for the Marxist organisation Socialist Action (Hong Kong supporters of CWI). Founded less than 18 months earlier, our organisation stood 22-year-old candidate Sally Tang Mei-ching in the working class constituency of Un Chau and So Uk (electorate: approximately 10,000). Electorally, the seat is one of the safest in Hong Kong for the pro-Beijing party DAB*, and therefore without any realistic prospect that our candidate could win. We got 493 votes, 8.4 percent, which is a good start, but the gains from the campaign in terms of influence, experience and support were much greater. We used this campaign as a platform to publicise our socialist solution in an area of high youth unemployment (12 percent), with one in five families below the poverty line. Despite its surface opulence, Hong Kong suffers from chronic social problems. This is illustrated by figures from the 34-country OECD group, among whose members average spending on housing, health, old age, employment and training, and family services comes to 19.2 percent of GDP. But in 2010, Hong Kong spent only 5.8 percent of GDP on these areas. For Marxists, participation in bourgeois ‘parliamentary’ elections is the equivalent of an ‘away match’ in football – i.e. it is not our natural element, which is mass working class struggle, strikes etc. Even by comparison with bourgeois parliamentarism overseas, with its many limitations, the district council elections in Hong Kong are loaded heavily in favour of the capitalist establishment. Sally Tang Mei-ching stood for Socialist Action in 2011 District Council elections. Hong Kong is a ‘controlled’ bourgeois democracy – a ‘dictocracy’– over which the Chinese dictatorship rules using control mechanisms inherited from the British colonial administration. The 18 district councils are purely advisory bodies, created under British rule to provide a façade of ‘democratic involvement’. One-fifth of the seats are appointed by the unelected Chief Executive, with the entire system dominated by government bureaucrats in league with corporate interests. Notwithstanding Chief Executive Donald Tsang Yam-kuen’s laughable claim that “Hong Kong’s electoral system is fair, open, just and transparent,” evidence is already emerging of widespread electoral fraud perpetrated by the pro-government camp. In the seat of Mei Foo South, for example, 13 adults with different surnames were registered at one address – an apartment owned by a Chinese People’s Political Consultative Conference (CPPCC – a Chinese government body) member in neighbouring Guangdong province. In another case, an elector was registered as residing on the 32nd floor of a 21-storey building! Extremely lax I.D. controls and a complete absence of crosschecking between government departments make it easy for the wealthiest parties – i.e. 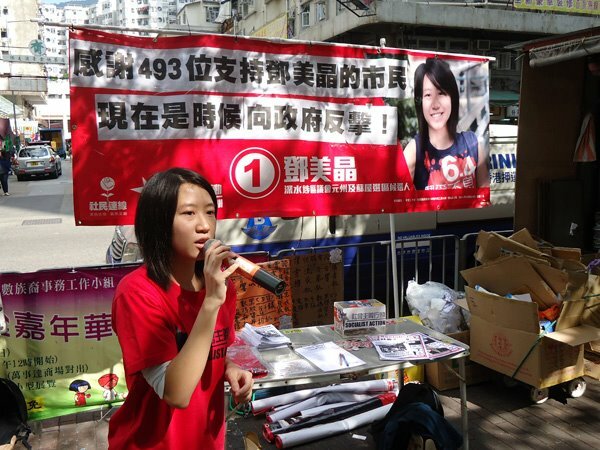 the pro-Beijing camp – to manipulate the results by registering ‘phantom battalions’ of supporters in key seats. The overall voter turnout this time was a relatively high 41.4 percent, compared to 38.8 percent in the district council elections of 2007. There were a record number of 120,000 new voter registrations, of which 90,000 were aged over 50 (youth participation in these elections was correspondingly low, in stark contrast to last year’s anti-establishment by-elections). The scale of fraud and vote-rigging in these elections will never be fully known, but was massive. Such abuses are easier in the district councils, elected according to a ‘Westminster model’, than for the Legislative Council, where a PR system applies (for the 50 percent of seats elected by popular vote). There was a well-orchestrated campaign by Beijing’s planners, on a seat-by-seat basis in some cases, to weed out ‘trouble-makers’ and inflict a demonstrative political defeat upon the pan democratic opposition in the run up to more important elections next year. These elections entailed other problems for a socialist organisation to overcome. There is great pressure on all political parties and candidates to view the district council elections as non-political, an idea cultivated by the establishment, which stresses ‘community work’ and a candidate’s ‘good local record’ and disapproves of ‘political sloganeering’. Most parties including those in the pan democratic camp are content to play this game, engaging in non-political philanthropic work, such as handing out moon cakes and picking up litter. While a socialist party will not shirk from local ‘casework’, helping residents fight bureaucracy and secure individual justice whenever this is possible, Socialist Action refused to fall into the ‘moon cake’ trap. What we offer is a political alternative to capitalism and authoritarian rule. The establishment camp, DAB etc., have more and better moon cakes! Socialist Action leaflets in English and Tagalog (Filipino). Despite an abundance of limitations and obstacles, Socialist Action decided the district council elections would nevertheless offer a platform from which we could propagate socialist ideas and connect with local struggle, to gain organisational and political experience, and build our periphery of supporters. This decision paid off. This was our first experience of running a mass campaign, which in Un Chau and So Uk included handing out more than 50,000 leaflets, knocking on over 5,000 doors and phoning hundreds of our promises to remind them to vote. 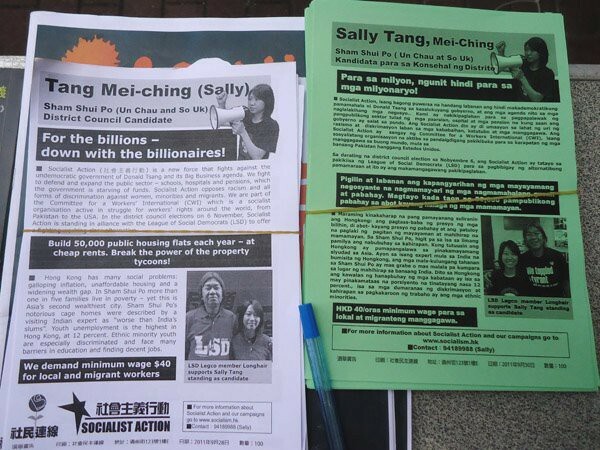 Even volunteers for a rival candidate praised the professionalism of the Socialist Action campaign, including leaflets in four languages (Chinese, English, Tagalog and Urdu). We met a very good response especially from ethnic minorities, with many Pakistani and Nepali youth and workers supporting us. We distributed 12,000 copies of our election manifesto, which explained among other things that Socialist Action is part of the CWI and fights for the creation of a new mass workers’ party. A major part of the campaign was our ‘street stations’ every day over a six-week period, with loudspeakers, stall, flags and roll-ups. Comrades took days of unpaid leave from their jobs, with one comrade quitting his job to become an election full-timer. LSD activists told us we had more campaigners than they had at constituency level. We easily had more activists out on a day-to day basis than our two rivals, except for Election Day, when we were heavily outnumbered although we had 26 volunteers out that day. We produced leaflets on more than 16 topics – two or more for each week of the campaign – on healthcare, racism, political violence, police repression, democracy, housing, minimum wage, transport, privatisation and more. These were distributed at the subway station early in the mornings, thousands each week. We also intervened in other activities during the election period, including the ‘O15’ Global Occupy day, at which Sally Tang Mei-ching was interviewed by the South China Morning Post and other media groups. In October month, we achieved the second best monthly sales result of the year for our now bi-monthly magazine, with 208 copies sold. Several small-scale demonstrations and protests actions were organised during the campaign, including a very successful action against the Link REIT, which runs 180 privatised shopping malls across Hong Kong. Our candidate conducted interviews with small shopkeepers in the local Link mall, which revealed rent increases of up to 300 percent following privatisation, with several businesses forced to close. This information was printed up in over 2,000 leaflets and spread to the media. Our campaign linked this issue to inflation – at a 16-year high – and the track record of the other candidates who had supported privatisation. A giant cheque for HK$9 million, representing the annual income of Link CEO George Kwok Lung Hongchoy, was torn to pieces at the entrance of the mall. Through this campaign Socialist Action was able to recruit several new members, hitting 80 percent of our recruitment target. We are now in the process of starting a second branch of the organisation, which was a major target of the campaign. Socialist Action took part in the elections under an agreement with the radical democratic party, League of Social Democrats (LSD). Without this, our candidature would have been ineligible – Socialist Action is not yet a registered party. This electoral alliance, with a party that we have previously cooperated with in several campaigns, meant that the campaign in the Un Chau and So Uk constituency was run on our programme and slogans, with all election leaflets and material written by us. Outside of this constituency we called for support for the LSD, of course, as the most radical of the major parties and providing the best basis for struggle after the elections. This alliance has become the focus of a certain debate with some other lefts, not only in Hong Kong but also inside China. Some left critics have claimed that CWI supporters “joined the LSD” (not true, although we would not rule this out under certain conditions), and claimed we have adapted politically to a non-socialist programme. This is simply not true. One critic likened our actions to the mistakes of the Chinese Communist Party (CCP) when it opportunistically submerged itself into the nationalist Kuomintang (KMT) in the 1920s. Leaving aside the very different character of the 1920s KMT and today’s LSD, Leon Trotsky argued that the CCP was wrong to merge, but should instead have proposed a bloc for joint action with the KMT, while preserving its own separate organisation and distinctly socialist political identity. Our experience has been that ordinary workers, youth and pensioners in Un Chau and So Uk have been much quicker to grasp and support our tactic of an electoral alliance than some self-proclaimed Marxists. Well attended street meeting to hear ‘Long Hair’ Leung Kwok-hung supporting Sally Tang’s campaign. While it was not our main focus in this election, Socialist Action’s approach and political stance also had a certain political influence upon the members of LSD, on issues like candidates pledging to live on a workers’ wage, for example, which is not the position of LSD although it is practised by its legislator ‘Long Hair’. Socialist Action recognised from the outset the issue of anti-migrant racism would be a big factor in this election. We made plans to respond to this and urged the LSD to do the same. LSD took a principled position in support of migrant rights and did not capitulate to the establishment’s anti-migrant chorus as for example the Democratic Party scandalously did. But unfortunately the LSD did not confront this issue openly during the campaign in the mistaken belief this task could be postponed until afterwards. The pro-Beijing camp circulated the most fantastical racist lies, using this issue as an important auxiliary to electoral fraud. These lies were not exposed and answered on a mass scale during the election campaign. Many LSD members now admit it was a mistake to try to sidestep this issue in the campaign. In Un Chau and So Uk Socialist Action produced 3,000 leaflets entitled ‘The truth about the right of abode issue’, warning against the pro-government camp’s lies and calling for a united fightback for jobs and welfare by workers of all nationalities. With these we did mass leafleting of the local subway and our ‘street stations’. We encountered some racist abuse (one caller asked rhetorically if our candidate ‘was a Filipino’) and a lot of confusion, but also succeeded to some extent in exposing the establishment’s methods. Socialist Action also organised a small but vocal counter-protest against the racist network ‘Caring Hong Kong Power’, a thinly veiled front for the DAB and pro-government camp. Our protest was reported in the media but unfortunately the rest of the left missed this chance to show firm opposition. This reflects a serious underestimation of the threat from racism and how it can develop in future. After the election results and perceived setbacks for the pan democratic camp, the split between its compromise and struggle wings has sharpened, with the former scurrying to get closer to the ‘victorious’ establishment, including its attacks on migrants. There is an urgent need for political regroupment involving those layers that want to reconstruct a fighting democratic movement and the LSD could provide a platform for this. Socialist Action will continue to fight energetically for democratic rights and social justice, alongside LSD and others. In so doing we also emphasise three things: the need for a socialist programme to replace the collapsing capitalist system, the blind alley of ‘parochialism’ (Hong Kong’s fate is linked to mass struggle against dictatorship inside China), and the need to create a workers’ party as the main force to transform society. The seat Socialist Action contested of Un Chau and So Uk was formerly two constituencies, with a history of DAB dominance especially in So Uk, many of whose predominantly elderly residents have been relocated in the past year to the newer estate of Un Chau. During the election campaign the DAB did very little open campaigning, which is not necessary or desirable from their standpoint. On Election Day they mobilised vast numbers of supporters and busloads of elderly voters. This is a big electoral machine that largely avoids politics. Un Chau and So Uk: DAB 3,403 votes, ADPL 1,947 Socialist Action/LSD 493 votes. To receive 493 votes was a good result, even if the vote was never our priority in this campaign. Socialist Action only began regular activity in the area six months ago and neither LSD nor Socialist Action had members there before this. In the 27 seats it contested, LSD’s average share of the total vote was 24 percent (far from the ‘fiasco’ presented in the capitalist media). In the four seats where LSD faced off against another pan democratic candidate (i.e. not only establishment or so-called ‘independent’ candidates), its average share was 7.9 percent. In the Un Chau estate the right-wing pan democratic party ADPL had a previously strong base, but its influence is now clearly in decline locally and everywhere else. Compared to the 2003 elections it has slipped from a total of 25 to 15 district council seats. The 8.4 percent vote for Sally Tang was not just an anti-DAB vote, but also a vote against the pro-capitalist policies and compromise line (vis-à-vis Beijing) of ADPL. It was a very conscious vote for a young, socialist, grassroots’ fighter. This is a very encouraging result to organise upon.